PHOTO BY ERICH CAMPING Garth Fagan Dance's 2016 home season is now on stage at Nazareth College's Arts Center. 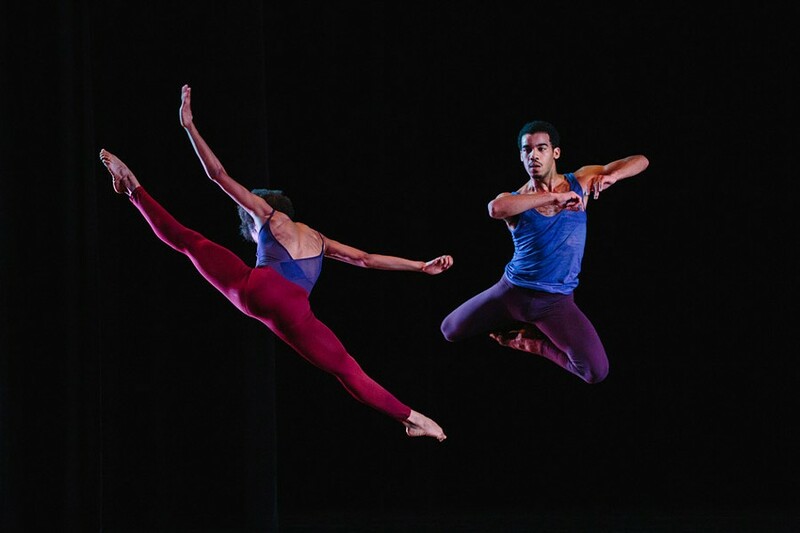 Garth Fagan Dance premiered two pieces to an appreciative audience Wednesday night at Nazareth College's Arts Center during the opening of its 2016 home season. Both pieces -- Fagan's "In Conflict" and Norwood Pennewell's "A Moderate Cease" -- were well-received, albeit different in sensibility. Pennewell's "A Moderate Cease," the sixth piece he has choreographed for the company, is his most affecting work yet. The deeply emotional performance, set to a cello concerto by Steven Isserlis, seems more personal than his other works; it also adheres more to his own developing choreographic style. Pennewell is a Fagan dancer -- that technique is ingrained in his work -- but this new piece uses more of his own expanding dance vocabulary. And it's just beautiful. The piece opens with a small group of dancers in a circle around a pool of light. They move gently at first, like creatures stirring in some moonlit glade deep in the woods. Arms are repeatedly thrust upwards to the resonant chords of the concerto, reaching, reaching ... then there is just Sade Bully, whose flawless dancing ensured the performance's success. Her long-limbed body moved with great feeling, taking low leaps and traversing the stage joyously without apparent effort. Guy Thorne and Vitolio Jeune, two powerhouse males, also took the house by storm, leaping and turning as the music swelled. And the lighting design by Lutin Tanner should also be noted for its use of shadows and light -- instrumental in conveying the reflective sadness and interspersed bursts of joy in Pennewell's piece. Fagan's "In Conflict," a work-in-progress, showcases his dancers in the language he commands. While Pennewell's piece seems more inner-directed, Fagan is addressing the world at large, and we should stop and listen. As the title suggests, the work examines conflict, both within one's self, between individuals, and perhaps, in the world in general. Two of Fagan's veteran dancers -- Natalie Rogers and Jeune -- perform compelling and challenging solos in this new, four-part piece. Set to the sonorous classical music of Arvo Part, this is a creation of moving and still shapes: Rogers holds one-legged balances for inhumanly long amounts of time; Jeune's explosive power is contained and then released. The piece begins with a solo by Rogers, who performs some gorgeous work while portraying a state of growing awareness. She is able to have the audience chuckling with her humor one minute and sighing over her sensuality the next. At one place in the performance she rises from a crouch up to a half-pointe balance, then slides back down into her crouched pose -- an incredibly difficult sequence. Jeune's solo follows with music that is edgier and high-powered leaps with no visible preparation. Again, the lighting contributes greatly. Behind Jeune are long blocks of shadow, like a skeletal building or the bars of a prison, which connote harshness and turmoil. Rogers and Jeune come together for a lovely duet in the third part of Fagan's piece and then we have a larger group conveying different types of relationships in the final section. The audience loved it. Wednesday night's program also included the beloved "Prelude: Discipline is Freedom" (1983), "No Evidence of Failure" (2013), and the celebratory "Geoffrey Holder Life Fete . . . Bacchanal" (2015), all of which were choreographed by Fagan. Garth Fagan Dance will perform this program again on Friday, December 2, through Sunday, December 4.